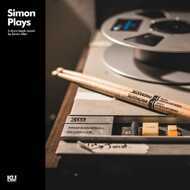 An original drum break record by Simon Allen (The New Mastersounds). This record has been created as a resource for sample-based music producers and provides a selection of 4/4 grooves and breaks: from minimalist to intricate, straight to swung, and also includes single hits of vintage kicks, snares, hi-hats, toms and cymbals, all recorded at ATA Records Studio A with 1960s analog recording gear onto 2” tape before being mixed and mastered for vinyl. Simon Allen is the drummer and co-founder of British funk quartet, The New Mastersounds. Since the band formed in Leeds, UK in 1999 he has played drums on all twelve of their studio albums and toured extensively across North America, Europe and Japan. On his adventures with NMS, Simon has jammed with funk and soul-jazz legends such as Fred Wesley, Pee Wee Ellis, Maceo Parker, Art Neville, Lou Donaldson and Melvin Sparks, as well as fellow drummers Bernard Purdie and Zigaboo Modeliste, all of whose music has profoundly influenced his “deep pocket” approach to the drum kit.